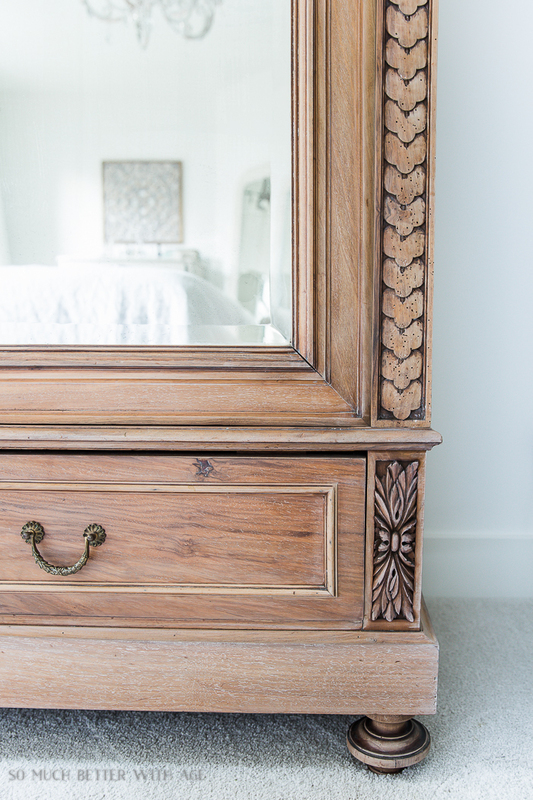 How do you decide whether to give an antique piece of furniture a makeover or not? 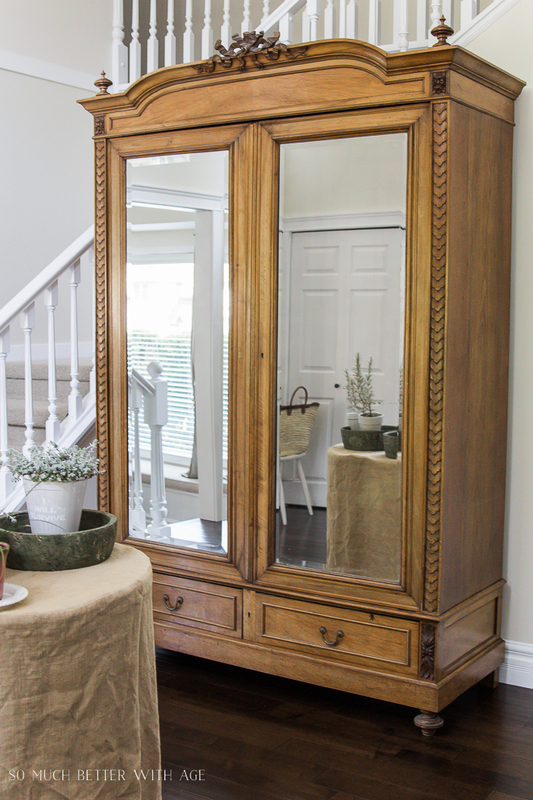 This antique armoire looks so amazing with a makeover but there are some key points to consider. 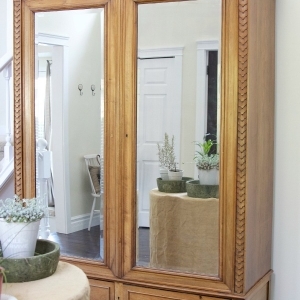 Do you remember this armoire that I posted about years ago? This armoire was given to me from a friend. It was left in their crawl space of the new house they bought and in 10 pieces. She knew how much I loved antiques so she just gave it to me and I had it set up at home. It goes together like a jigsaw puzzle which explains how they were able to move massive pieces of furniture up tight staircases and doorways back in the 1800s. And yes, I forgot to mention that piece of information, it’s from the 1800s! So why did I give it a makeover, you are probably wondering. 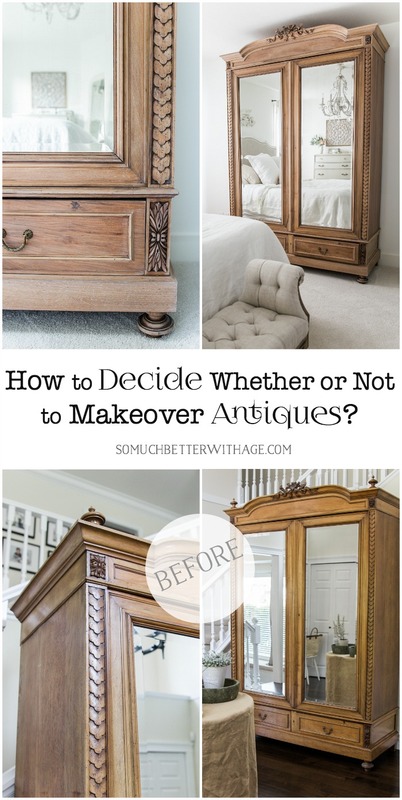 And how do you decide whether or not to give an antique piece of furniture a makeover? The biggest thing I didn’t like about the armoire was that it had a very orange-y stain and a glossy varnish. I never wanted to give it a makeover by stripping it or painting it as I knew it would diminish its worth but it still bothered me. It is 8 feet high which is roughly the same as the ceiling height in my current house. When the armoire was assembled together in my previous house, we noticed the back structure was not entirely secure. The armoire is not secured together with screws or nails or anything like that. It stacks together at the base and the bolts from the front doors hold with the weight of the top piece on top. It truly is a marvel piece of furniture! Anyway, the back wasn’t as secure as we would have liked and with small children running around it, we decided to add metal plates and screws to the back of it for security. There were also a few dents, chips and we noticed that the top ornamental piece was cut in half, probably to make it fit into a room a long time ago. There were also no definite markings on the piece anywhere from the furniture maker. I knew from these deficits, that the piece would only be worth what someone would pay for it. I even tried to sell it for a time and did not get any buyers. So I knew it was fate and I had to keep her. family or friends wants to give you a piece of furniture. If they didn’t want it to have a makeover, they shouldn’t have given you the piece of furniture! Every time someone wants to give me a piece of furniture, I first tell them that if they do, it might get a makeover so they are fully aware. Some people like to know that their piece of furniture is off living some glamorous life untouched. But if no one is enjoying it, then it is not making anyone happy. And if that person is trying to get rid of it, then they don’t want it either! There is no point making others feel guilty by not allowing them to do what they want with it. Just make sure to mention that you may or may not give it a makeover. That person can also sell it online. If they find there are no buyers, it’s probably because of the finish! 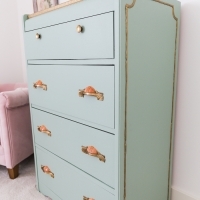 Giving a piece of furniture a makeover is far better than it landing up in the landfill. Know that I knew I wanted to give her a makeover, I had to figure out what kind of makeover to give her. I knew I didn’t want to paint her. She was just too pretty! I also knew deep down it would hurt a little to splash paint over all that beautiful inlay and relief work. The only choice then was to sand her down. That’s right! This entire thing was sanded down…by hand…by my boyfriend last summer! He used the two different sanders that I owned plus a Dremel sanding tool for all the tiny crevices. It was a mammoth of a job and probably took about 3-4 weeks in total, doing pieces at a time. After you sand a piece of wood furniture down to the natural grain, you can pretty much do anything to it! It’s a blank canvas! I wanted to keep it a natural wood and leave it as is. 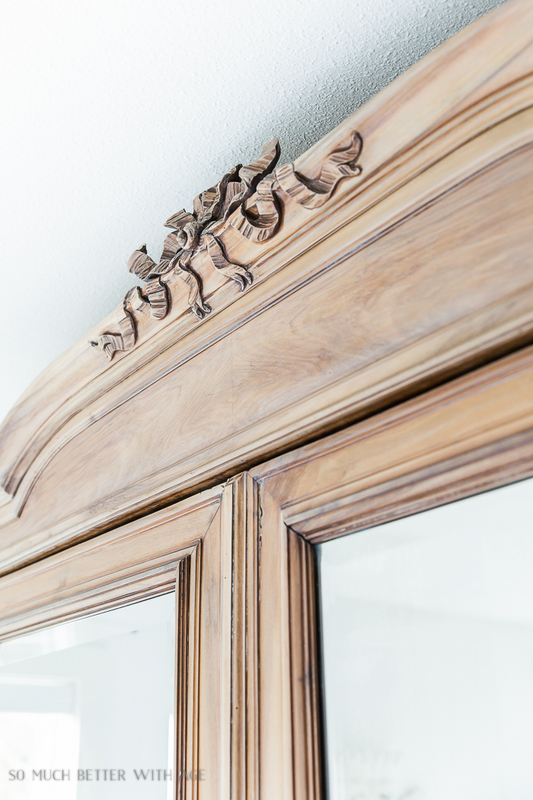 After doing some research, I was told that leaving the natural wood exposed to the elements and oil from fingers (we use this armoire daily for clothes), we decided it needed to have some sort of finish. I didn’t want it to have a polyurethane finish although I’m sure a matte poly finish would look fine. I had considered liming the wood to give it a nice whitewashed look but thought that might look too ‘white’ as I loved the natural wood tones. We could have used a clear furniture wax on the piece but we finally opted for a white furniture wax finish, very light buffing most of it off. 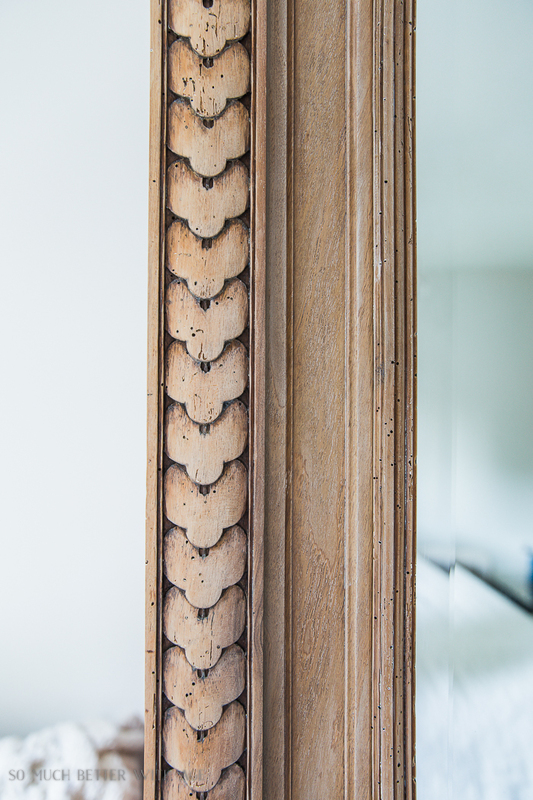 The final result is a slightly white patina mixed into the grain of the wood. You can still see the natural wood color and the depth of the wood reliefs. There were different woods used in this piece of furniture so some of the parts pick up more of the white than others and I like that. My worry with using a clear furniture wax was that some parts could go dark with it and I wanted it to stay light. It’s such an amazing piece of furniture and I feel it’s even better now. I’m so grateful for this kind gift and will cherish it forever, especially since it was such a labor of love. There was so much work involved in this piece but at the end of the day, it only cost the price of the wax. There’s nothing more satisfying than working on a beautiful piece of furniture to match your home decor and to love forever. There’s no point in living with a finish that you don’t like. The furniture always remains a classic but the finish on it makes it up to date. I think that’s how that armoire got left at that house, it was such a big undertaking! Thanks Linda! haha it’s so true! Thanks Diana. I’ve always admired this piece when first seeing it as everything about it is beautiful. This piece deserves to stand out just as you/your guy did it. What an awesome gift from a friend and truly a keeper forever! 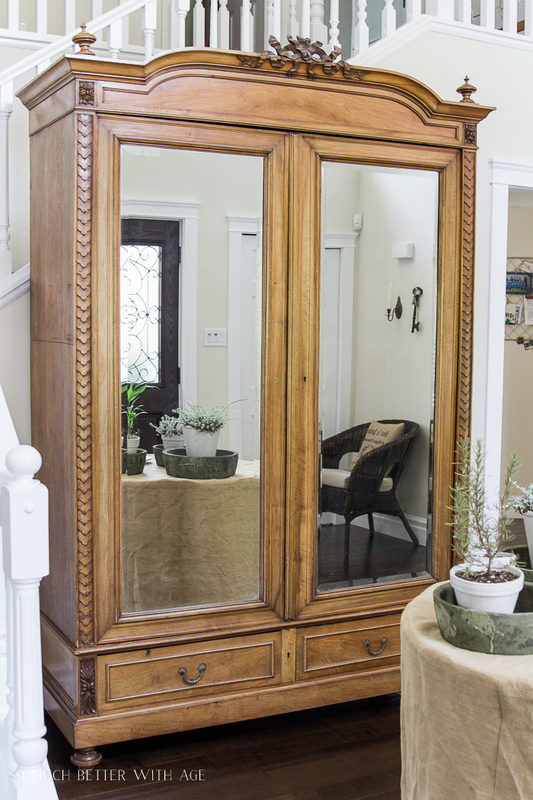 Love the mirrored doors too – did you install these or was it like this when received? Thank you so much, Julie! The mirrors came with it. I’ve considered taking them out but they are solidly in there. One side has antiqued already but it’s hard to tell in photos. 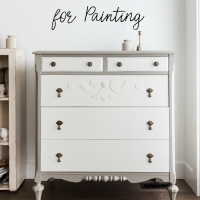 All the while I was reading your post, my head kept saying over & over, “don’t paint it, don’t paint it.” I love your result & am soooo glad you left this beautiful piece of furniture show off it’s wood. You are right, too many people just slap paint on old furniture!! haha I know, right? Don’t worry, I could never paint it. I’m happy that beautiful old piece found a home with someone that loves and appreciates it. I think your new finish is perfect. I agree! Painting over those details would not have made you as happy as the subtle white you have now. 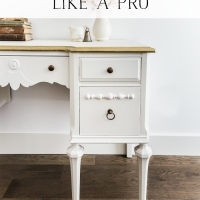 I’ve been going to refinish my oak bureau & tall boy but was undecided about painting it – go light or go dark? Now, I know exactly how I’m going to tackle them. They’ll look so much better with my new upholstered headboard. Thank you for inspiration! The natural wood would look gorgeous, Joanna. I have an oak piece I’m considering stripping down too. Sometimes oak looks a bit orange so I think a white wax would look pretty on it too. oh, my!! that is so gorgeous!! so happy there are people like you who take the time and care about beautiful old pieces. Now it will be a treasure forever, or until the lady in 3018 decides to do it in orangy veneer, all the rage in 3018… ha! haha this is hilarious and so true!! Yes in 1000 years people will be looking at my armoire thinking, why on earth would she do that? It needs to be glossy orange lol. Thanks Ruby! Fantastic piece, love how you finished it! It is such a great piece and love what you decided to do. Thanks i know this will help with some pieces i have and what to do. Have a great weekend. Thank you, Marlene! So glad I inspired you. Absolutely refinish a piece if it makes you happy! It belongs to the owner and no one else. Did you use any liquid finish remover in the nooks and crannies? The chemicals are nasty but it would get in small spaces. Hi Bonnie, I considered that but the finish wasn’t really thick on the ornate parts of the armoire so it was just sanded down a bit. I would definitely use something if there was paint on it I was trying to remove. Thank you! I have a custom cherry table I have been wanting to stain darker to blend with my other furnishings. Thanks for this timely post. Thanks K! It sounds like it will look gorgeous sanded down and given a new stain. It will be so rewarding! Gorgeous! Definitely the right decision. Gorgeous girl!! Love how it turned out! I WOULD BUY THIS ANY DAY!! EVEN IN IT’S “BEFORE” STATE WHICH I THOUGHT WAS INCREDIBLY BEAUTIFUL!!! EMAIL ME ANY TIME IF YOU WANT TO SELL IT! 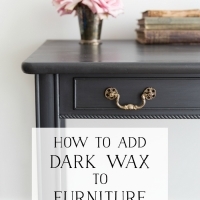 Jamie, I have refinished so many pieces except for our mammoth armoire – I just had no idea what to do with it and have been waffling about whether painting or stripping it will ruin a good piece……but after reading this I am tempted to go get my sander this very second!! 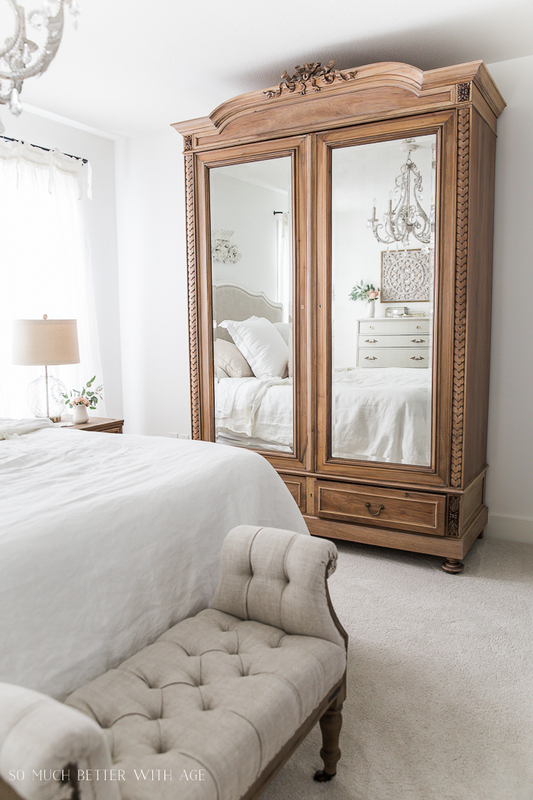 Your armoire is SO beautiful and the new finish is perfection, I love it!! Such a great post! Aww, thanks Lisa! I do the same thing with every piece of furniture and always come to the same conclusion. I’ve had pieces for years that I’ve refinished and painted and still love them. I love them more once I’ve refinished them they way I want. I really love these old things, they have this grand look you cannot find. I think you could fix that thing at the top someone cut in half. It reminds me of a large bow. 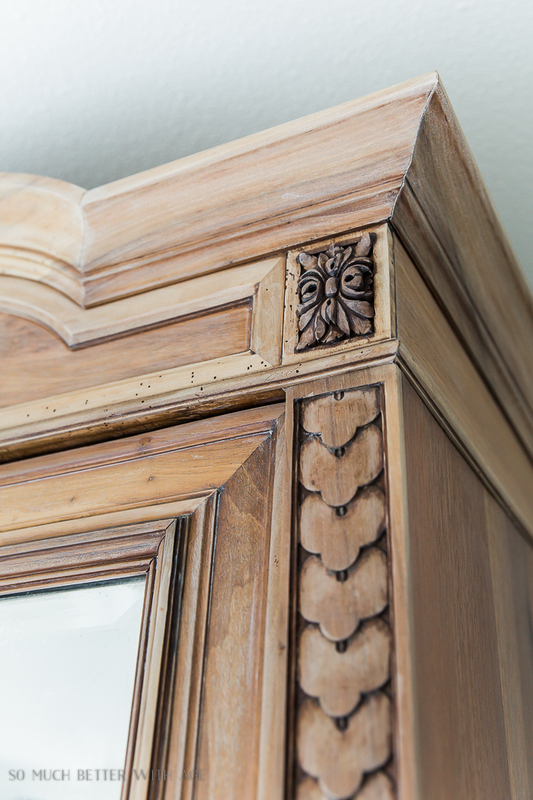 Some furniture refinishers make molds of pieces to replace the missing elements. Love it! Thanks Kellei, I agree, the grand look cannot be duplicated. I’ll have to look into that! I think it was a bow originally at the top. Wow! It is truly a stunning piece! This is such a beautiful and informative post. 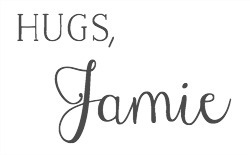 I will be featuring you at Thursday Favorite Things tomorrow! I hope you will come back and link up again this week. Happy Valentine’s Day! 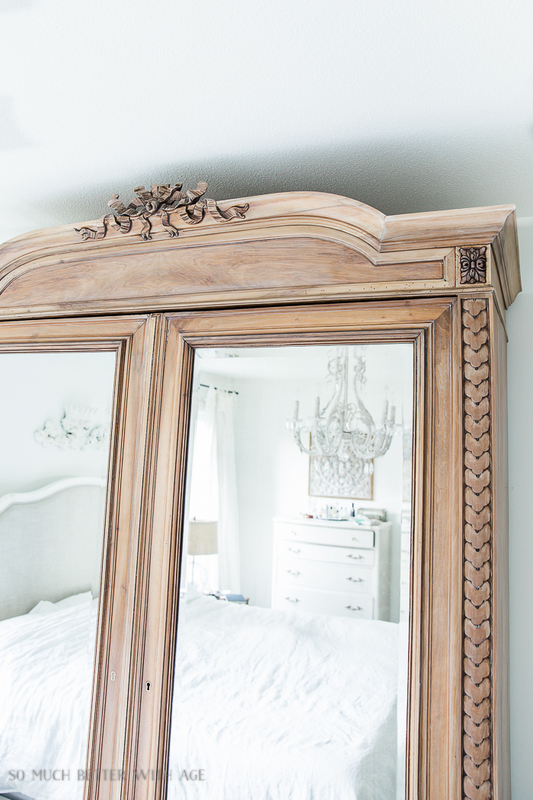 This piece is absolutely gorgeous and it looks perfect in your room! Hi Linda, the armoire is holding up really well so far! No greasy fingermarks anywhere. I was worried about that and heard that just a clear wax would still love oil marks. I’m not sure why the white wax is so much different but apparently adding color to the wax is an extra line of defence. You can use a lot of white wax or very little so I used very little to get a more natural look. I waxed it really good but wiped the majority off for a natural seal. I think it would be a great solution for you too. PS: I would either sand it down again or use a solvent to get the previous wax off before adding the white wax to it or you’ll end up with the same problem. Wow, so beautiful,,,also was worried the “after” would be painted…it is perfect. The white wax is nice, maybe I could use that on a buffet I have. Thanks, just pinned it. I think lots of people thought I was going to paint it! I love the white wax too. Thanks Jillian! It’s stunning! I imagine the sanding was quite tedious, but I’m sure you love looking at it everyday. Inspiring! So tedious! Thanks so much, April. I adore the look you gave this beautiful piece! I am going to use your idea on a chest that needs refinishing. Thank you. Could you please tell me the source of the curtains in this room please? Are you aware that all the tiny holes on the top of the piece are from powder post beetles? Not something you want in your house to get into all your wood furniture. We learned the hard way a couple of years ago. Yes I am. 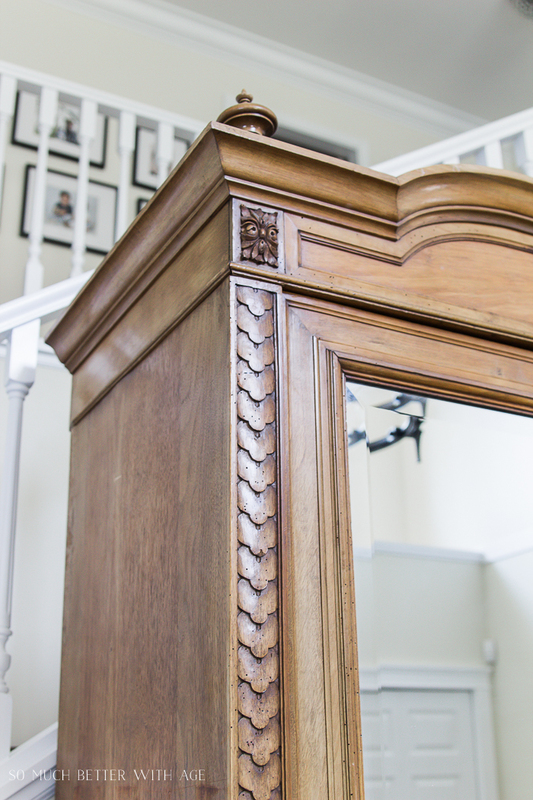 This armoire is from the 1800s and has no sign of inhabitants. I’ve had it for many years. I had a dining room table with the beetles and they constantly created a dust. 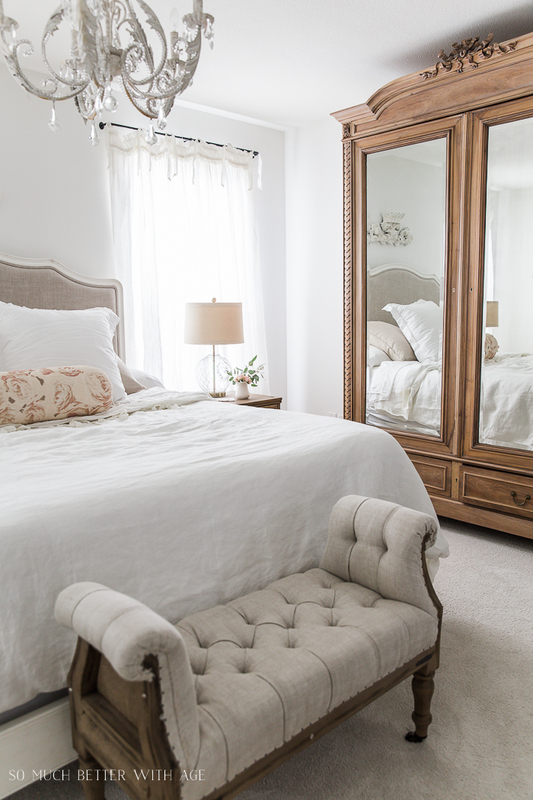 This is such a beautiful makeover! Congratulations on a really pretty piece. I absolutely love that you kept its character but still managed to bring it to modern days somehow. I really love it! I completely agree with the reasons you chose for making over a piece of furniture. I may add that when you do makeover a worthless piece of furniture, you give it the worth of your labour and that’s priceless, isn’t it? Joelle! That’s the best reason! It totally is priceless now. Thank you so much for your sweet comment. Your armoire is beautiful with its update ~ subtle difference but I can see the white wax now that you’ve shared it in close-up photos. Kuddos to your boyfriend for all his hardwork!!! Sounds like he’s a keeper! <3 Pinned to my Perfect Paint board that I'll be renaming to Perfect Finish. Thanks so much, Barbara. It’s my favorite piece of furniture in the house! My parents want to buy an antique furniture to match the rustic theme of our home. It was mentioned here that antiques need a makeover if they don’t like the finish. Moreover, it’s recommended to go to trusted furniture shops for antique furniture.